Some call it separation lighting, others prefer the term isolation lighting, but both mean the proper lighting technique to separate your subject from the background. While this technique is applied just about everywhere in photography where a subject is the main focus, this technique is a particular for Stock Photography, where the proper separation technique determines if your image will sell or not. As you will see, the lighting techniques that I will show you are very straight forward and you can easily use them to make a decent side income on sites like Dreamstime. If you want to learn more about Stock Photography, check out my recent posts (here and here). Separation Lighting Setup 1 With this setup, you have a main light on camera left to light the subject, a fill light on camera right to fill in the shadows, and a separation light on the background. If you don't have three lights, you can also use a reflector for fill. To get a cleaner separation light (e.g. for high key white backgrounds), use two lights on the backgrounds placed on each side and a little behind the subject. Separation Lighting Setup 2 This setup is very similar to the first setup, but instead of having a strobe standing on the floor and illuminating the background, you now have a boom arm with a softbox on it. This has the advantage that you can tilt the softbox over your subject, which gives you a nice specular highlight (hairlight). Naturally, this method is not as good for high key white backgrounds. Separation Lighting Setup 3 For this setup you either need a really big softbox or a translucent background that you can light up from behind. 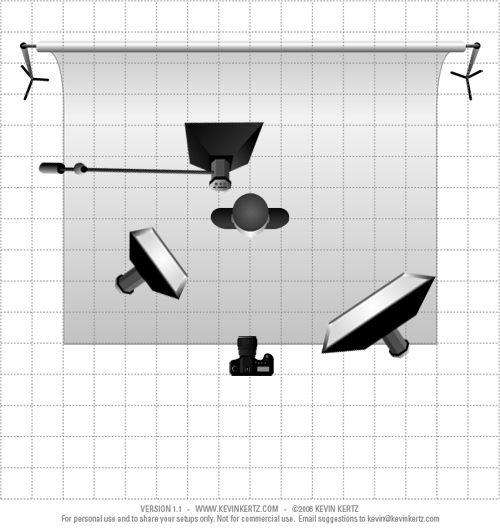 Aside from that, the main light and fill light are the same as the first two setups. Just be sure that you know how to avoid unwanted lens flare or loss in contrast, when you use this setup. Plug If you like this post, you can help me keep writing stuff like this by buying your camera equipment using my promotional links for Amazon, Adorama, and B&H Photo. I have been using these stores for years for their great customer service, quality, and low prices. Using these links does not cost you anything, but it helps me cover some of the costs associated with running a website and taking time out of my day to write these posts.